Yacht Interior & Exterior Design, Naval Architecture and Consultancy. NS is specialized on steel and wooden hulls with aluminyum and wooden superstructures. NS provides projects depending on Rina, ABS, mca, SOLAS and IMO rules. The specialized yacht interior team serves boatowners and boatyards to grow the yacht's value. Turkey. 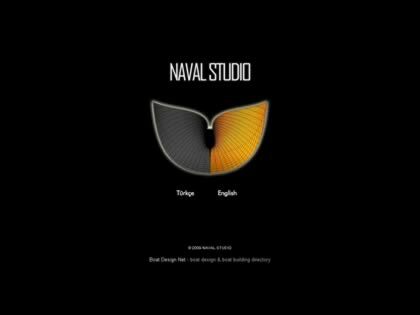 Web Site Snapshot: If available, above is a snapshot of the Naval Studio web site at http://www.navalstudio.com as it appeared when this site was added to the directory or last verified. Please Note that Boat Design Net has no involvement with the above web site; all content and images depicted in the above thumbnail are the property and copyright of Naval Studio unless otherwise noted on that site. Description: Yacht Interior & Exterior Design, Naval Architecture and Consultancy. NS is specialized on steel and wooden hulls with aluminyum and wooden superstructures. NS provides projects depending on Rina, ABS, mca, SOLAS and IMO rules. The specialized yacht interior team serves boatowners and boatyards to grow the yacht's value. Turkey.